Fatal Crash in Illinois Renews Debate Over Cable Barriers | Hupy and Abraham, S.C.
On Sunday, July 6, 2014, Mitchell Bledsoe and Karla Blake were riding along I-55 near Springfield, Illinois. When Bledsoe realized that traffic had slowed in front of him, he began braking and eventually ended up losing control and sliding onto the median shoulder. What probably turned this into a fatal crash was the fact there was a three strand wire barricade just beyond the rumble strips on the median shoulder. Wire barricades are designed to prevent vehicles from crossing over the median into oncoming traffic. There is some debate as to how effective they are, but the general concensus is that they do work most of the time. The problem facing motorcyclists is the wires are at the exact height a motorcyclist's body would be at in a slide or the height of a rider's legs in the event of a rolling contact. rider's refer to the devices as "slice and dice" barriers. Sunday's crash was the second fatal motorcycle accident near this I-55 location in a year. The Illinois Department of Transportation began installing the median wire barriers in 2005. Since that time, there has been continued debate over their effectiveness and the perceived dangers to motorcyclists. The NHTSA published the findings of a study by the German Federal Highway Research Institute which said the risk of serious injury to motorcyclists was high with regard to the cable barrier systems. 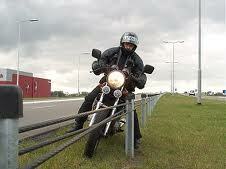 Conversely, a study in the United Kingdom found there was no difference between cable barriers or any other style barriers when comparing injuries to motorcyclists. In fact, the UK study went so far as to say motorcyclists are separated from the bike in most crashes and are sliding and slowing down by the time they reach the barriers, and that cables did not cause extraordinary injury. That UK study no doubt will not sit well with motorcyclists. Of special concern is the wire barrier system along I-55 that Bledsoe and Blake struck was so close to the highway, there was no room or time for any deceleration during sliding. In fact, there was probably not much sliding at all in that case. There was also a comprehensive study done in New Zealand with some intriguing findings. Here's hoping this tragic crash will renew the examination of barrier and crash prevention systems and take the motorcycle into consideration when planning highway designs or implementation of barriers.